Math Games are fun exercises to teach basic math principles. Some of the math games are too advanced for preschool. For this reason, they appear in a separate section. Additional math activities can be found under Davar Start Games, F. Numbers and Numerals. Act out the situations on the poster. Someone plays “1 baby.” “2 buckets” are carried. “3 students” work in the garden. Etc. Repeat the names of the numerals. Make mistakes (particularly in the mother tongue) and have the students correct you. Variation 1: Have the class make the poster. They think up and draw #1, #2, #3, etc. I tems needed: room to move around; line on the floor or ground. A. Students who take too many steps must go back to the beginning. B. The student who is “it” might specify the type of step as well as the number of steps. For example: “1 giant step” or “3 baby steps” or “5 jumps” or “4 hops” or even “2 steps backwards.” Students who do not follow the directions must go back to the beginning. Game 4: How Many Did You Hear? The students are very quiet. One sits (or stands) in front with his/her eyes closed. The leader points to a student; he quietly walks to stand behind the student whose eyes are closed. Once he’s there, the leader points to another student. This goes on until the desired number of students stands in the line. Then the student with his eyes closed may guess how many stand in the line behind him. Have the whole class count out loud. Did the student hear correctly? Teaches: listening and concentration; staying quiet; taking turns; counting. There needs to be as many in each row as there are dots on the drawing. If there are already too many children by one drawing, the rest run to other drawings. Once the row for a particular drawing is complete, the children in that row sit on the ground. Count the children around each drawing. Is it correct? Once the class has practiced the game, it can be played with two teams. Have two series of drawings and two groups of children. Which group finishes first? Game 6: How Many Fit? Activity: Write a numeral on the board. Draw the correct number of dots after it. Discuss this with the class. At the agreed-upon signal (such as a whistle), the students stand on each paper or in the circles. The number in each group must be the same as the number written on the board. Check if this is correct. Praise the students for correct groupings. Variation: If there are less than 15 in the group, have the students lay the correct number of markers (buttons, stones, bottle caps . . .) on each piece of paper instead of standing on the papers. Needed: Posters or chalk board with 1, 2, 3, 4, and 5 dots drawn on them; piece of paper for each student; something for them to draw with. Activity: Set the drawings of 1, 2, 3, 4, and 5 dots in front of the class. 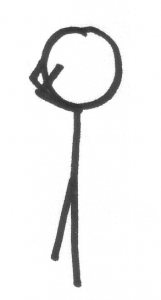 Ask students to stand in front of the number they like the best. Count how many are in each row. The number with the longest row wins. Each student takes home a paper with the number of dots (or crosses or X’s or whatever) which has won. Needed: traditional storyteller or story from students’ culture; papers or cards for every one with 1, 2, 3, 4, and 5 written on them. Additionally might also have sheet of paper for each person and something to write with. Traditional storyteller tells story in the local language. 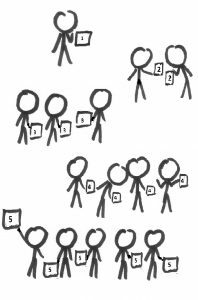 Each time a number is used in the story, the class members hold up a card with that number on it. Note which number occurs most often. Have someone from the class re-tell the story in the national language. The others help count. How many brothers/sisters/frogs/fishermen were there? How many times did the donkey take the wrong path? How many beans were in the bag? If desired, have the class draw features from the story with the corresponding numeral written on the paper: 7 swans; 3 beans; 2 boats . . .. Needed: paper and something to write with for everyone in the class. Activity: have everyone practice writing their favorite number. Together, find as many similarities between the shape of the numeral and things in everyday life. For example, “1” looks like a stick; “8” like a pretzel they just ate . . . whatever they can imagine. Then have everyone write a their favorite number and turn the numeral into a drawing. For example, “9” might be a girl with long, curly hair; “2” might be a swan or a goose . . . . If they prefer, they might make the drawing of something that looks like or reminds them of the number next to the numeral written on the paper. It is possible to use the same games with another number—whichever one has “won” in Game 3 above, or whichever one you want to focus on. One student stands in front: Number 1. Source of music (tape? CD? Radio?). Way to draw a large triangle on the ground or on the floor, perhaps with masking tape (on the floor) or chalk (on pavement) or a line in the dirt (ground). Draw or make a large triangle. One student stands in each corner of the triangle. How many students are in the triangle? As the music plays, the other students walk around the triangle. When the music stops, each student in the triangle pulls one other student into the triangle. There are now 6 students inside. Have the class count them. Change the written number to 6. Continue until all the students are inside the triangle. Count after each time the music stops. Variation A: repeat with other shapes such as a square (4 students inside), a pentagon, or a hexagon. Variation B: Have the three in the triangle tag or touch another person. That person has to switch places. The ones who come out (or the ones who go in) have to do something three times such as jumping up and down, shouting, squats, touching their toes . . . . Variation C: Give each person 5 items to begin with (different colored slips of paper, lids from plastic bottles, feathers, leaves). The ones walking around the triangle hold their items where everyone can see them. If they are tagged, they must put one item in the triangle. Count the number of items in the triangle after each round. Decide ahead of time when the game is over–when the first person has lost all their items? When the last person has lost all their items? If using small pieces of fruit or crackers, make sure everyone gets to eat them when the game is over. Needed: chair for each student; room to move. Activity: Touch the ground in three places (check first that it is culturally appropriate to touch the ground. If not, choose another object like the w all or a chair or . . .). 1 student must touch the ground in 3 places. For example, hand, foot, head OR 2 feet, one hand. Let the students be creative. Then all the students touch the ground in the same 3 ways. 2 students together must touch the ground in only 3 places (3 feet?). All the students pair up and touch the ground in the same 3 ways. 3 students . . .
3 students with a chair may only touch the floor in 3 places (one on the chair & the other 3 with one foot on the ground?). All the students get in groups of 4 and do the same. 4 students with a chair may only touch the floor in 3 places (for example, 2 on the chair & the other 3 on one leg). The other students get in groups of 5 and do the same. Play the game with a different number. 1 student must touch the floor in 4 ways. Then 2 students together must touch the floor in only 4 ways, etc., etc. Needed: Three people and one chair; one chair for each group of 3 people. Do it once with a group of 3 class members as an example. Then divide the class into groups of three, making sure each group has one chair. Give the directions quickly and have one person from the class make sure that the directions are correctly followed by all the others. 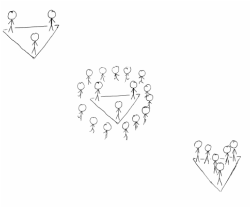 Play the game using different numbers: 2 people and one chair or 4 people and one chair. Have someone from the class give the directions. Use something other than a chair. A table? A box? 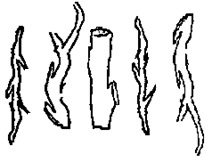 Something to represent a stream (large drawing or long piece of blue cloth or two ropes laid on the ground to represent the two banks of the stream or two lines drawn in the dirt or . . . ). Have 5 people stand on one side of the stream. Tap the ones that are supposed to jump into the stream on the shoulder. Tap the ones that are supposed to jump over the stream on the back. At the agreed-upon signal, they all jump. The class yells out “Splash!” when some of them land in the water. 5 were dry. Now only 3 are dry. Write: 5-2 = 3. Repeat the game with the 3 who are dry. How many landed in the water this time? Write 3 – 2 = 1. Do the same with different sums. Variation: Instead of acting out the equation and then writing it down, give the class an equation and then have them act it out themselves. Needed: Sheet of paper for each student; pencils/pens; crayons, colored pencils, markers or paint. Each student traces around one hand. Draw the fingernails on the fingers. Tell the students to pretend they have been painting and have gotten their fingers all covered in paint. Do the same with 4 + 1 = 5, etc. 5 children stand in front of the group. The rest of the children close their eyes and count to 20. Two of the 5 children hide. When the rest of the children open their eyes, these two are gone. Count the children who are left. Write on the board: 5 – 2 = 3. Do the same with other numbers. 5 – 3 = 2; 6 – 1 = 5; etc. Variation: May also be played with objects such as stuffed animals (soft toys), nuts, stones, . . . .
A small box or something light like a small box. 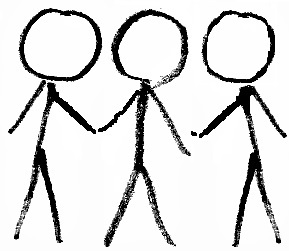 Four people stand in front of the group. Discuss how many there will be in total if each one gets a partner. Choose 4 more and let them stand. Write up the board (or other prominent place) 4 x 2 = 8. Have those who are standing pair up. Each pair joins both hands. 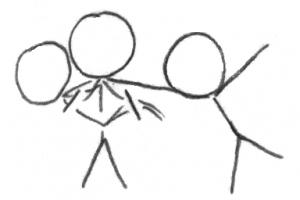 The pairs make a row with their hands in the middle. Lay a box (or other large, light object like a stuffed animal or large ball) on the first two hands. They must pass the box down the row without letting go of each other’s hands. 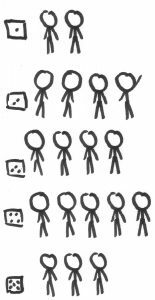 When the box reaches the end of the row, begin the game again with different members of the class and a different sum. For fun, may add a penalty if the box (or ball) falls down. Perhaps everyone in the “caterpillar” has to jump up and down 4x, since the class is multiplying by 4. Start with #2 rather than #4. Game 18: Just the Same? Needed: Have two large circles on the ground (made with chalk or tape; or some big round thing like hula hoops). 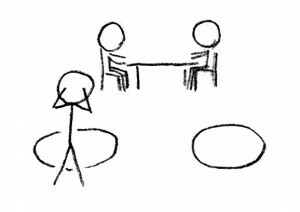 Activity: One student stands in front of a circle with his/her eyes closed and their back to the group. Now it needs to be very, very quiet. The leader chooses a certain number of students who go stand in the circle as quietly as possible. The student with his/her eyes closed listens carefully. Then he tells how many he heard. Variation: Have three circles. Practice the multiplication table x 3. Needed: Bottle caps, buttons, or some other small item for each student. Draw three circles on the ground, one inside the other. In the outer circle, nothing (or x1). One by one the students may throw their bottle cap or button into the target. Once all the students are finished, count the points. A lid/button in the center gets more points than one in the outside circle. How many points did we make? Divide the students into two teams. Have one team go, then count their points. Have the other team go, then count their points. Which team has more points? OR Each team has a different color or type of bottle cap (button). Have all the students throw their bottle cap onto the target. Then count the points each team has earned. Needed: place to jump; tape or chalk to make jumping squares in two different colors. Activity: Prepare ahead of time or together with the class: squares to jump into in one long row. Alternate two different colors of squares. Number the squares from 1-2-3- up to 10 or even 20. Make the color of the numbers match the color of the square. All the odd numbers will be white, for instance, and all the even numbers green. Divide the class into two teams. The teams take turns jumping one by one along the row of colors. 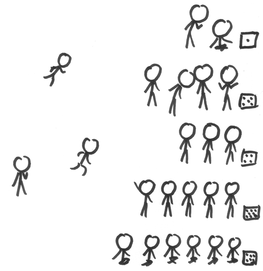 As each person jumps, they also say the name of the number. Keep score: one point for each team member who does this correctly. First jump onto each square, counting 1, 2, 3, 4, . . . . The team with the most points gets a prize. The prize might be a privilege (choosing the next game; being first in line for something . . .). The prize might also be thinking up a penalty for the other team (they all have to run around in a circle three times, they have to jump up and down making a noise like a frog . . .). 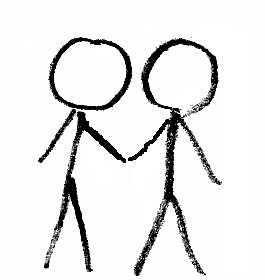 Note to leader: This may also be drawn in the dirt or outlined with stones. Then use two different shapes instead of two different colors. For instance, circles for odd numbers and squares for even ones. A set of 10 cups, bowls, or other small containers with a paper under each one. Have one or two children help set the 10 cups or bowls in one long row. Count the cups out loud. Then put two small things in each cup (children may help do this). Now count the number of nuts (or raisins). How many do we have by cup number 1? 2. Write “2” on the paper by this cup. Count how many are in cup 1 AND 2. 4. Write “4” on the paper by the second cup. Continue like this down the entire row. The children write 2, 4, 6, 8, etc., on their own pieces of paper. When you have done cup 10, the children may divide the things evenly (fairly)and eat. Write the whole sum on the board: 1 x 2 = 2; 2 x 2 = 4; 3 x 2 = 6, etc. Anyone who can say the whole row of 2,4,6,8,10,12,14,16,18,20 from memory gets a medal or certificate. Needed: Pencils. Sheet of paper for everyone with 10 big circles on it. Under each circle, write one part of the multiplication table for two: 1 x 2; 2 x 2; 3 x 2; etc..
Hand out the papers with the 10 big circles on them. In each circle, class members draw as many little bugs as the answer to the equation under that circle. Variation: May also do this for multiplication by 3, 4, or possibly even 5.